Bidding process has started to replace the two North Station drawspans with two three-track drawbridges. 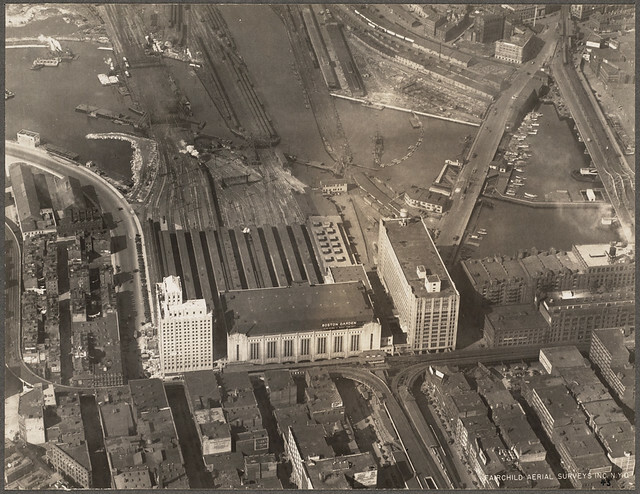 Should just build a new North station at Boston Sand and Gravel. All this to get trains just across the river and then stop. Seriously, for $100 million (the cost to just design it)... they could buy out Boston Sand and gravel and build a bunch of platforms on the North side of the river. And then most people can just walk over a pedestrian bridge, transfer to the Orange line or Green Line or whatever. That configuration would eventually work better with NSRL and a new underground "North Station" also. Last edited by tangent; 10-15-2018 at 11:59 AM. I would suspect that the long deep locks and the systems to cycle them would be more expensive than the drawbridges. Or just say boats are not allowed to travel between the harbor and the river... I mean how many extra millions are we spending on draw bridges and locks for how many boats? I know I know... it's the law. But we are supposed to be able to change laws when they become excessively wasteful and onerous... Like spending tens of millions in taxpayer money to provide a right of way for 75 to 100 boats that mostly spend their time docked at the marina or just stay in the river anyway and duck boats. $100 million is the design and construction cost. And relocating a major station more than a quarter mile further away from its transit links just to get out of rebuilding a bridge strikes me as... not a great plan. Sorry thought the article said it was $100 million for just the design. $100 million isn't that bad then for a bridge replacement project. Just frustrating that NSRL is dead in the water and the MBTA is clearly paying lip service to it. It's not just a rehab. They're expanding track capacity from 2 to 3 on the approach spans for a lot more fluidity coming on/off the platforms and in/out of the fan-out of tracks at Tower A interlocking. It's a substantial capacity enhancement that'll ease the traffic crunch there a lot. You still may need a third draw if the entire North gets Indigo-fied on every mainline out to 128 and the 495-land schedules start buffing out and crossing the NH state line. And need it with or without NSRL because that's growth by orders of magnitude. But the draw rehabs are using every ounce of engineering flex to squeeze out more immediately usable capacity, and that is a Very Good Thing for the price. Another part of this project is the complete rebuild/redesign of the front and back ladders of Tower A Interlocking. They are badly in need of work. Reconnecting Mainline 1 at the Back Ladder would be a no brainer too. Are there examples where people have..dropped boats down under fixed bridges via deep locks)? Last edited by Arlington; 10-16-2018 at 01:36 PM. Reconnecting Mainline 1 at the Back Ladder would be a no brainer too. Is that the unused (and sometimes unballasted) track alongside Boston Sand and Gravel? Have plans been discussed for the laying of piles for 1 or 2 future skyscrapers spaced for for future track expansion and train shed? How in the hell are you going to get into a skyscraper surrounded on all 4 sides by the Leverett ramps and the busiest cement plant in New England (which is too permanently busy churning out concrete for all other Boston talls to ever evict from its property). Is Dear Leader now just building empty inaccessible towers for the sheer fun of it like they do in Pyongyang? Jesus Christ, can we please confine nth-stage hitting of the supertall crackpipe to the smoking ruins of the Dev forum sarcophagus, please??? Unless I'm misreading Obda, he's proposing adding supports for air rights over the North Station tracks (including the new 11/12). Seems reasonable to me, although the Spaulding parking lots will get redeveloped first. The track hard along Boston Sand & Gravel is called the Tuttle Track and is active. Stub ended unfortunately. We were using to store an Amtrak set last month during the day. Mainline 1 ends at the Back ladder (Gilmore Bridge) and hopefully gets restored to FX one of these days. Are there concrete plans to remove the old Spaulding building? I thought its newer portion fouled the approach for 11/12. Update from someone who knows: it does *not* foul the current plans for track 11-12. Its removal may be required for future platform lengthening. The most obstructive thing about Spaulding was the operationally-sensitive liquified gas (N2?) tank that used to sit on this pad, directly in the path of any new track. Here's the spitball plan for threading in the new tracks from the document F-line linked earlier. It requires shortening platform E a bit to give the room required to snake in the lead track for the new platform past Spaulding. […]Draws 3 & 4 became expendable once steam locomotives were retired...Fully one-half of the moves across the 4 draws were non-revenue backup moves that cycled inbound-facing trainsets for outbound-facing trainsets....you would never need more than Draw 3. Last edited by Arlington; 10-17-2018 at 10:37 AM. Yes, this. NS has too many short platforms that can't open all doors on >5 car consists. The T still needs to pick itself up off the procurement floor and order another 125+ bi-levels to replace the rapidly aging 29-32 year old Bombardier fleet of flats so there's one more pivot to make before platform lengthening has to go on the table. But northside rush hour will demand six-packs of bi-levels within a decade and the Downeaster's probably going to get lengthened now that Amtrak is finally RFP'ing for its Amfleet replacements. Spaulding building is currently being rented by MGH for overflow admin office space, but everybody inside is on a short-term lease so nobody's anticipating that building to be more than a year-to-year concern. Tracks 1 & 2 are the shortest tracks, with Track 8-9-10 the longest. A good example of some operational problems was yesterday with the Downeaster. 686 was 12 car lengths long due to extra equipment for Southampton Street Yard on the rear. Wouldn't fit anywhere and had to wait for No.331 to leave off Track 7. Due to the late return of the Southampton St extra, it was tacked on to 688/689's equipment on Track 10. If NO, what are MassDOT's plans for eminent domain?